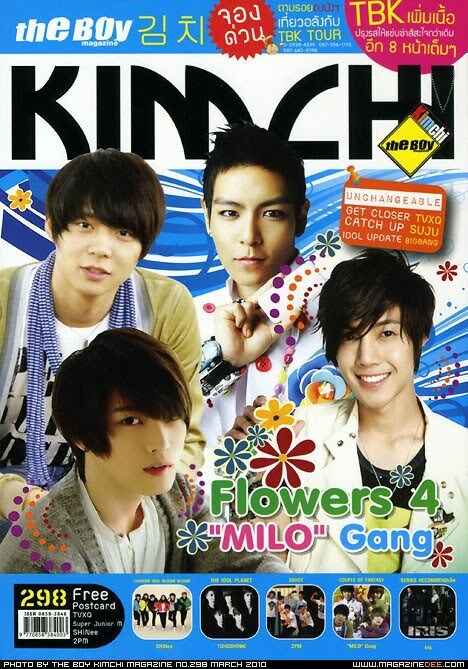 F4 Idol cover decorated Hero of TVXQ, Micky and SS501′s Kim Hyun Joong, Top of Big Bang is popular in Korea, most are members of the group. Their friendship was even introduced in Kimchi the Boy, fantastic friendship of Kim Hyun Joong and Hero in Idol Top 4 is a well known fact already been mentioned on the air. The reaction of Netizens were funny leaving a comment like, “the four of them shine!” “I posted this, did you know” “But I mean, the magazine named Kimchi” “Good Example! of similar person”, Etc. Meanwhile, in Thailand, the Hallyu Magazine like ’ASTA (asta)’, ‘kimchi looks more’ spreading the news and entertainment in South Korea is hugely popular. Hallyu Magazine offers a variety of information like Drama, as well as the latest celebrity news and trends, tours location, it is said to be the role of talking point for the Hallyu chores.